A genus with a single species endemic to the western Mediterranean where, although not globally threatened, it is Critically Endangered in Spain and Malta due to fire and grazing. Shrub or small monecious tree 6–15m tall, evergreen, with a pyramidal habit in immature plants, irregular when older; trunk often multistemmed and coppicing from base. Bark with small, thick, angular scaly plates or exfoliating in longitudinal flakes; greyish–brown weathering dark or ash–grey, cinnamon beneath when exposed. Branches articulate, branching alternately at different angles, flat, forming open ‘sprays’. Leaves 1.6–8 x 1–1.5cm, decussate, borne in whorls of 4mm, scale–like. Female cones 0.6–1.2cm, angular globose, with four thick scales arranged in two opposite pairs, green at first and ripening brown and sometimes covered with a very distinctive pure white blume. Male cones, solitary, ovoid–globes, ca. 4 x 2.5mm, reddish, maturing yellowish–brown. 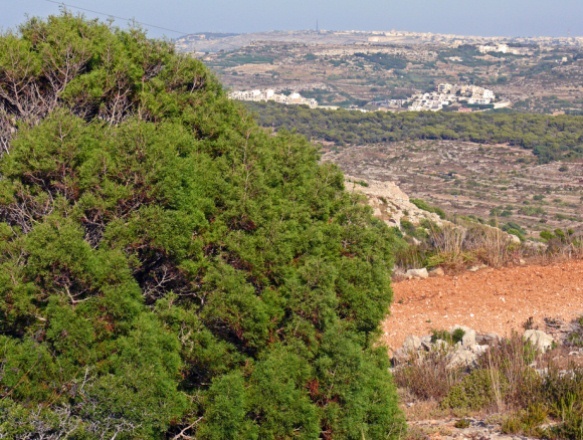 Malta: occurs in four locations with less than 130 mature trees: (i) the Mellieha area at: Wied il-Mizieb also referred to as Ta’ Pennellu (100 trees), Gnien Ingraw (less than 10) and Ras il-Griebeg (2 trees) ; (ii) il-Maqluba (one small tree); (iii) Central–eastern part of Malta, in the Mosta area at Wied il–Gasel (2–3 trees) and San Guzepp tat–Targa (one old tree); (iv) at Ic–Cagak (limits of Mgarr, NW Malta). There are conflicting views on nativity of Tetraclinis in some of its sites. Reliably published details on wild populations for Malta are either very old (Abela, 1647; Borg, 1927), or only published in Maltese (e.g. Stevens & Baldacchino, 2000). Reliable scientific literature in English is very scarce. Further confusion has been caused because in the past Tetraclinis has previously been mistaken for the non-native Juniperus phoenicea. Unfortunately Juniperus phoenicea bears the same Maltese name as Tetraclinis–għargħar (pronounced arar), which has complicated matters further. Tetraclinis, which was declared the Maltese National Tree in 1992. 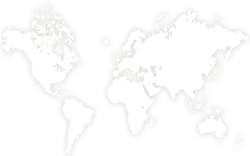 Morocco: extensive distribution in six zones: Rif mountains, Eastern Morocco, Eastern middle Atlas, Valleys of the central plateau and eastern Meseta, Western Middle Atlas and High Atlas, Anti Atlas. It is estimated to cover more than 600,000 hectares. Spain: Region of Murcia on either side of the city of Cartagena in three distinct locations. These are west of the city of Cartagena at Monte Roldan and Algameca with two east of Cartegena which consist of the following named sites: Escombreras, Fausilla, Cola del Caballo, Cabezo de la Galera, Cenizas-Peña de Aguila, Atamaria, and El Sabinar. The largest site is at Cenizas–Peña de Aguila (7.56km²). 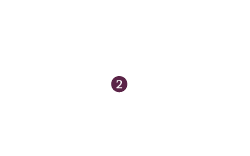 The total Area of Occupancy is 10.3km² with an extent of occurrence of 83.8km². Over the last 20 years the number of individuals is estimated to have increased three-fold as a result of regeneration following fires. The current number of sexually mature individuals is estimated to be over 1000 out of a total population of 7500–8000 compared with four years earlier when the estimate was between 5000–5500. The majority of the population is east of Cartegena, especially in the Monte de las Cenzias and Peña de Aguila area within the Parque Natural de Calbanque. While the number of mature trees may increase as young trees become mature, there is very limited potential expansion in the total extent of occurrence. Tunisia: mainly distributed in three mountainous areas of Jbel Boukornine (Ben Arous), Jebl Lattrech (Nabeul) and Jbel Zaghouan (Zaghouan). In Tunisia it covers a total of 34,000ha (Ministère de l´Agriculture, 1995). Tetraclinis ranges from near sea level to 1800m and in most parts of its range precipitation ranges from 300–500mm per year. It has the ability to coppice which is an important adaptation to survive wildfires and moderate levels of animal browsing. Old–growth trees that have sprouted repeatedly over a long period form large burrs at the base, known as lupias. Malta it occurs in ‘garigue’ communities on steep crevices and gorges with a substrate of coralline limestones and calcareous soils between 30 and 200m above sea-level. The vegetation of these areas is usually typical of the thermo-Mediterranean region, with plants adapted to considerable dry periods, with chamaephytic shrubs, geophytes or therophytes. Associated native species include: Periploca angustifolia, Ceratonia siliqua Rhamnus oleoides, Euphorbia melitensis, Chiliadenus bocconei, Opuntia ficus-barbarica, Asparagus aphyllus, Teucrium fruticans, Andropogon distachyus, Brachypodium retusum, Hyparrhenia hirta, Piptatherum caerulescens and Asphodelus aestivus. Male cones start appearing in November (sometimes before), shedding pollen sometimes up to March. The female cones produce viable seed in most locations. Spain It occurs in a sparse open habitat where it is associated with: Pinus halepensis, Quercus ilex, Quercus coccifera, Pistacia lentiscus, Rhamnus lycioides, R. oleoides ssp. angustifolia, Maytenus senegalensis subsp. europaea, Calicotome intermedia, Periploca angustifolia, Clematis cirrhosa and Chamaerops humilis. Altitude range is from 6-390m. It grows in a range of soils, but tends to be restricted to the Triassic limestone, avoiding the metamorphic, micaceous and graphitous schists. The climate typically has long hot summers (with 150 ‘biologically dry’ days per annum) when temperatures can reach as high as 40°C and mild winters in which temperatures rarely fall below 0°C. The annual rainfall is ca 300mm; most precipitation occurs during September, October and November. Adult trees usually respond to fires by coppicing; repeated fires prevent regeneration from seed and may eventually kill adults. 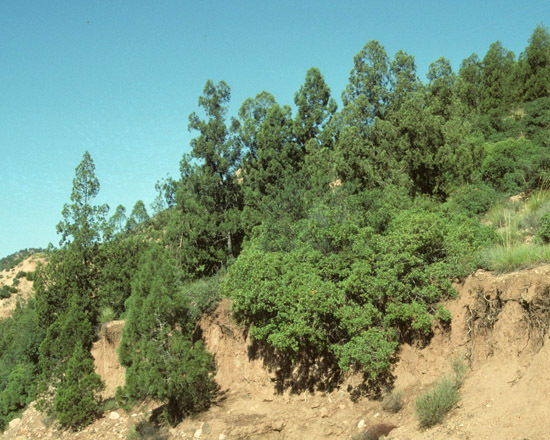 Tunisia Woodlands of Tetraclinis occur in areas with a maritime influence and a semi-arid climate in calcareous and siliceous substrates with an altitudinal range from sea–level to 700m. The main associated species do not include other tree species but instaed shrubs such as: Lavandula stoechas, Cistus monspelliensis, Genista aspalatoides, Erica arborea and the herbs Bracypodium ramosum, Avena bromoides and Lupinis angustifolius. Historically the wood has been used for making yokes (for use in mines) and for the construction of houses. Due to its unusual grain and rich colour, burr-wood (known as Thuja-burr) has in recent years become increasingly popular especially for kitchen utensils and household ornaments. Large burls, sometimes weighing in excess of 450 kilos, are produced underground as a result of repeated coppicing following fire, grazing or cutting. Overharvesting in Morocco has led the government to ban the export of the wood. Resin from the wood, known as sandarac gum, is used to make liquor and in Morocco it is used as a remedy for difficult childbirth. It is has many other uses including the treatment of cramps, roundworm, tapeworm and insomnia. Due to its extensive distribution in North Africa, this species is assessed as Least Concern although some small subpopulations (Malta and Spain) are highly threatened and there is some evidence of decline in the main parts of its range due to fire and grazing. 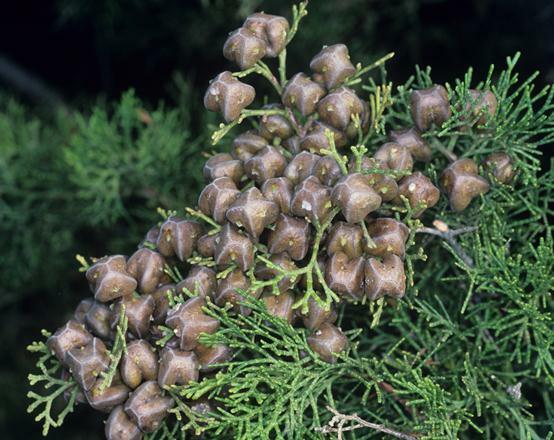 Tetraclinis articulata was once much more common in Malta and the various places called Ghar–ghar, Ghar–ghur etc. point out to the existence of a wider distribution, and possibly small forests (Borg, 1927). It apparently disappeared centuries to decades ago, mostly due to habitat alteration and land reclamation (Stevens & Baldacchino, 2000). The Area of Occupancy (AOO) is calculated as 6km² as a result of thorough ground-based surveys. The AOO has been calculated using 1km² grid cells; the 4km² grid recommended by IUCN guidelines is too coarse for relatively small islands such as Malta. The population is severely fragmented, being limited to only 4 locations which, although only ca 5–13km apart, are isolated by urban and agricultural developments.The main threats today include habitat modification and/or destruction (including land reclamation and the clearance of the vegetation) and human-induced disturbance, including the introduction of alien species such as Acacia saligna and Eucalyptus spp. Afforestation and reforestation programmes in its distribution range with indigenous and alien trees, which do not form part of its biotope are also important threats. Competition from invasive species such as exotic Pinus spp. and particularly the native P. halepensis are also seen as threats. The total extent of occurrence (EOO) is calculated to be 83.8km², with an actual area of occupancy (AOO) of 10.3km². The EOO is within the 100km² threshold for Critically Endangered. Subpopulations are fragmented and there is a continuing decline in the quality of the habitat due to the principle threat of urbanization, including the establishment of sport facilities such as golf courses. Historically, human-set fires have had the greatest impact on the populations. The most notable fire occurred in September 1992 when 55ha were burnt affecting a significant proportion of the population (Nicolás et al., 2004). Regeneration after fire can be rapid although it is estimated to take 10-20 years for burnt areas to recover (López–Hernández et al. 1995). A serious fire in the main part of the population (e.g. Cenizas–Peña de Aguila) has the potential of eradicating up to 80% of the population. Post-fire regeneration of competing species such as Pinus halepensis is a problem until the plants of Tetraclinis reach maturity. Mining has been a cause for concern in the past. The extensive heaps of spoil have caused serious fragmentation of the population. In some parts of its range (El Sabinar), regeneration is hampered by grazing for sheep and goats. 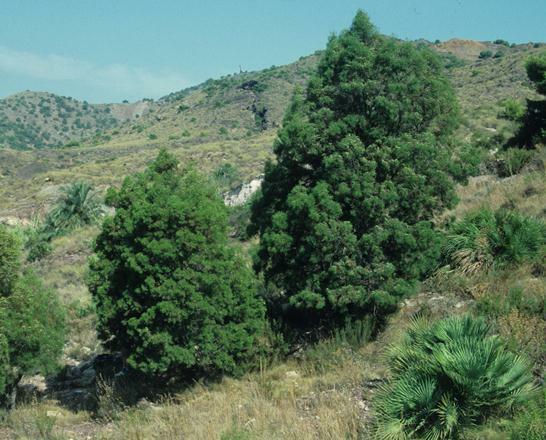 Competition from invasive species is also of concern; the most detrimental species being Pinus halepensis (García Martínez, 2008). Tetraclinis is frequently cultivated in southern Spain in gardens and as a plantation species. Some of these plantations are located close to the native population. 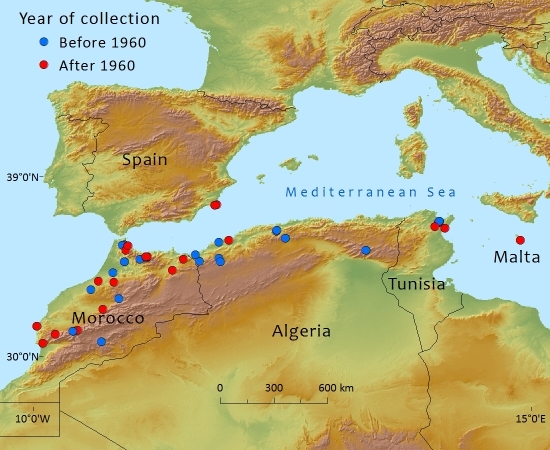 It is thought that the origin of this germplasm is the North African (Morocco) population. Genetic contamination could be a problem although to date no studies have been carried out to investigate its potential impact. The total area that the species covers is estimated at 35,000ha of which over 28,000ha is represented by between 25% an 75% cover. Although some of this is subject to a degree of degredation, some woodlands, particularly near urban areas (eg those near to Jbel Boukornine) suffer from repeated burning and other areas are subject to grazing, this is not significant and does not qualify as being threatened. The proposed National Assessment is of Least Concern but If the decline continues, then it may qualify as Near Threatened in the future. Abela, G.F. (1647). Della descrittione di Malta: isola nel mare Siciliano con le sue Antichità, ed altre Notizie. Malta: Paolo Bonacota, xiv + 573 pp. Printed as a facsimile edition in 1984 by MidSea Books Ltd. (Malta) as the Melitensia Book Club Issue no. 1. Ayyad, M. A. (2003). Case studies in the conservation of biodiversity: degradation and threats. Journal of Arid Environments. 54, 2003, pp. 165–182. Borg, J. (1927). Descriptive Flora of the Maltese Islands. Malta: Government Printing Office. 846 pp. Esteve-Selma, M.A.,Martínez-Fernández, J., Hernández, I., Montávez, J.P., Lopez, J.J., Calvo, J.F. & Robledano, F. (2010). Effects of climatic change on the distribution and conservation of Mediterranean forests: the case of Tetraclinis articulata in the Iberian Peninsula. Biodiversity & Conservation. 19(13): 3809-3825. García Martínez, M. S., Grau Almero, E. & Ros Sala, M. M. (2008). El paisje vegetal Pre- y Protohistórico de la costa de Mazarrón (Murcia) según el antracoanálisis de punta de los Gavilanes. Rev. Quaternary & Geomorphology. 22(3-4): 107-120. Houerou, H.N. (1969). Le végétation de la Tunisie steppique. Annales de l'Institut National de la Recherche Agronomique de Tunisie. 42(5): 620. López-Hernández J. (2000). Respuesta ambiental de las principales especies arbustivas en sistemas áridos y semiáridos mediterráneos: Modelos y Aplicaciones. Thesis doctoral;. Universidad de Murcia. Moore, H. M., Fox, H. R., Harrouni, M. C. and El Alami, A. (1998). Environmental challenges in the Rif mountains, northern Morocco. Environmental Conservation. 25(4): 354-365. Moreno, J.C. (coord.). (2008). Lista Roja 2008 de la Flora Vascular Española. Dirección General de Medio Natural y Política Forestal (Ministerio de Medio Ambiente, y Medio Rural y Marino, y Sociedad Española de Biología de la Conservación de Plantas), Madrid. Nicolás, M.J., Esteve, M.A., Palazón, J.A. and Hernández, J.J.L. (2004). Modelo sobre las preferencias de hábitat a escala local de Tetraclinis articulata (Vahl) Masters en una población del límite septentrional de su área de distribución. Anales de Biología. 26: 157-167. Sánchez Gómez, P., Carrión, MÁ., Hernández, A. & Guerra, J. (2002). Libro rojo de la flora silvestre protegida de la Región de Murcia. Vol. I,(II). Consejería de Agricultura, Agua y Medio Ambiente. Dirección General del Medio Natural. Comunidad Autónoma de la Región de Murcia. 686 pp. Murcia. Sommier, S. (1906.) A proposito della Callitris quadrivalvis Ric. 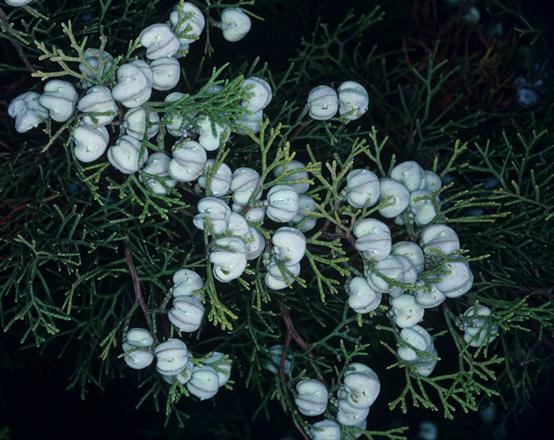 (Thuja quadrivalvis Vahl.) scoperta a Malta dal consocio Caruana-Gatto. Bulletino Della Società Botanica Italiana. (5-6):115. Stevens, D.T, & Baldacchino, A.E. (2000): Sigar Maltin, Sigar Barranin, il-Harsien taghhom u l-obbligi Nazzjonali u Internazzjonali. In: Baldacchino, A.E. & Stevens, D.T. (eds.) Is-Sigar Maltin: l-Uzu u l-Importanza, pp. 53-100. Malta: Environment Protection Department. Templado, J. (1975). El arara, Tetraclinis articulata en las Sierras de Cartagena. Bol. Estac. Centr. Ecol. 3(5): 43-56. P. Sánchez Gómez ,D.Stevens,M.Fennane,S.Tahar,M.F. Gardner,and P.I.Thomas, 2015. Tetraclinis articulata, from the website, Threatened Conifers of The World (http://threatenedconifers.rbge.org.uk/taxa/details/79).